Today’s post is written by Janet B. Learn more about Janet on our About Us page. But food isn’t the only focus. 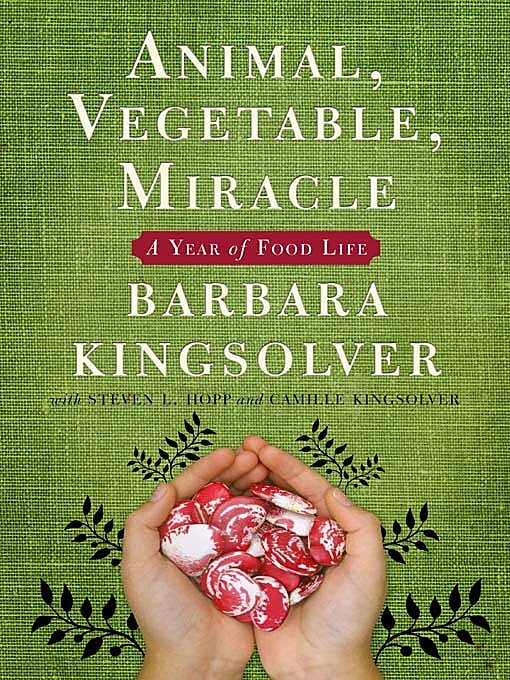 Kingsolver seeks to educate us on how our eating impacts the land, the earth, and even the United States. Touching on the hot-button topics of today, sidebars throughout the book (contributed by husband Steven) provide the basic facts about the impacts that pesticides, chemical fertilizers, big factory farming and concentrated animal feeding operations (CAFOs) have on the soil, rivers, oceans and people who are forced to deal with the repercussions. Genetically Modified Organisms, or GMOs, feature prominently in the warnings about our food system, the dwindling diversity of food crops and the troubles inherent in a competitive, unproven and untested field dominated by chemical companies. From explaining the hazards inherent in heavily dominated seed distribution, genetically modified organisms (GMOs) to the dietary implications of corn subsidies, these concise primers give context and added information about the alarming state of food in the United States, along with ways to insulate oneself and contribute positively to the local food movement and improve the health of the land. Don’t mistake this for an overbearing, preachy novel, however. Chickens lose their heads, fireflies delight city folks, pumpkin tureens disintegrate on the Thanksgiving table… these are real people with real faults and flaws just trying to pull their own weight in the world. Barbara and Steven make both the project and the book a family affair. Teen-aged daughter Camille applies their knowledge to the real world with creative (and delicious) recipes using seasonally-available ingredients. She also relates a positive teenager’s view on a somewhat unpopular lifestyle: that of a farmer’s daughter. Even the entrepreneurial youngster Lily gets in on the family vocation by raising chickens and selling eggs. The story is told from a human, honest perspective of someone who just wants to eat good, wholesome food. You’ll find no judgment in these pages, only amusing anecdotes and encouragement and rational, referenced facts. Foodies, gardeners, and environmentalists will find this book very appealing, and anyone with an open mind will enjoy the new understanding of how our food system really works and what growing your own food would be like. This book has a permanent home on my All-Time Top 5 list. Each year I read the book again, gleaning new facts, encouragement and a kinship with the Kingsolvers, who have inspired me to become food-independent, as well. More than any other book, though, it has changed my life and my perspective on everything from zucchini to the Amish. It has certainly enriched me in ways I would never have suspected. Expand your horizons and give this book a spot on your e-reader shelf. This looks like one that I need to put on my “to read” list, which is growing really long! Wow – your review has really inspired me to pick this book up. I try to be as “green” as possible and constantly lament the crappy food choices we have in America (while scratching my head and saying, “WHY aren’t we producing this here?” This, esp., as all AZ produce seems to come from Mexico, all year round). Don’t even get me started on corn subsidies, pesticides on food, genetically modified seeds … Do tell about your food-independence successes! Hi Melissa! Thanks for coming over to check us out! I’ll let Janet fill you in on her food independence successes, but I always learn new things from her about gardening and living sustainably. Small changes make a big difference, even where I live in downtown Chicago. I don’t live in a space where I could grow my own food, but at least now I know how to shop smarter at the grocery store and farmer’s markets. Janet has also started the Internet Seed Exchange on FB where you can swap seeds and gardening knowledge with others. It’s an open group and all who are interested are welcome to join in the discussion! We made some very drastic lifestyle changes in the last few years in pursuit of what this book offers, starting with quitting our jobs and moving 400 miles away to the middle of nowhere. The hard decisions made and implemented, now we are in the early years of learning how to grow food, live and farm sustainably, and rewiring ourselves to follow frugal habits and conserving even the smallest things. So far, we are in our third year of growing food, and manage to produce about 20% of our summertime food requirements even during the learning phase. This year our focus is variety: what grows well, what doesn’t, what will we eat a lot of? It’s not that expensive and sure is a lot of fun to try new stuff! I highly recommend it to even casual gardeners. Thank you, ladies. So inspiring. I live in the desert and have tried my hand at gardening twice, to no avail (it’s SO different than gardening in PA, where I grew up). But I’m not giving up. I love what you both are doing. Thanks so much for the seed info as well!